I occasionally use Azureus (a bit torrent manager) to find episodes of TV shows I missed (which I promptly delete) or to download open source programs (I never use it for anything illegal of course ;). Anyway, a few weeks ago I downloaded a few torrents and started them in Azureus. I was headed out of town for about 10 days and was going to leave my computer running while gone so I could access any files I needed. With the torrents I downloaded running, my computer would have something to do for the 10 days I’d be gone. But no sooner had I walked out the door and gotten a chance to check on my computer then I started noticing some strange errors in Azureus. I was suspicious at first that it may have to do with the fact that I was downloading a whole bunch of torrents and may have run out of hard drive space on my “torrent” drive (an old 80gb drive used just for torrents). I checked the drive space and it was getting low, so I stopped a few of the torrents, deleted the files they had downloaded, and figured that would solve the problem, freeing up some space. No such luck. The next time I logged into my computer I found the same errors. There are, in fact, two separate errors that pop up and I wasn’t really sure what was going on. 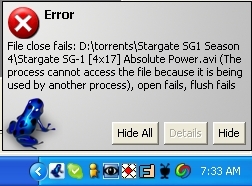 If you look closely at the error messages, the error is on a specific part of the torrent that is being downloaded (in this case they are .avi files). I wasn’t sure what the problem was, but continued to think that it may just be these particular torrents since I had never had this problem before or it may be tied to my earlier problem with the hard drive being too full. 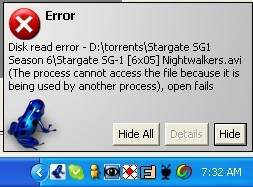 Either way, if I stopped the torrent and then started it again, the torrent would reset (Azureus would check each torrent again) and then run for a while before giving me the error again. Since I could get it to go away and each torrent would run for a few hours before running into the error, I figured I could live with the problem for a while. Well, I tried that, but eventually the error messages got so bad that I decided to do a little sleuthing on the internet to see if anyone had encountered a similar problem. It took some searching, but I finally found someone who had a solution to the problem. 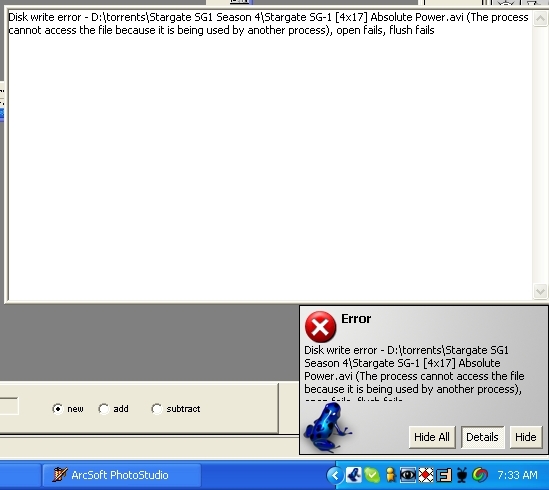 The culprit wasn’t my low hard drive space, Azureus, or the torrents. The culprit was, get this – Google Desktop. 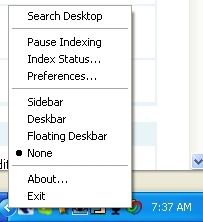 That’s right, it’s the nifty program I use once every two or three weeks to find something on my computer that has gone missing. Apparently Google Desktop was indexing my torrents while they were running. And if it was indexing the file while Azureus was trying to access it, they would run into a conflict and Google Desktop would win – blocking out Azureus and resulting in the error messages I was getting. I’m not positive on this, but I think I did upgrade Google Desktop around the same time I started getting the error messages. (6) Restart your torrents and you should be good to go. The website I found said it had some issues with getting Google Desktop to not index the torrents after telling it not to. After I told it not to, I didn’t have a problem (I waited two days and had no more errors). In order to get pictures for this “how to,” I again allowed Google Desktop to index my torrent drive and within about six hours it had killed all of my torrents. So, I’m almost 100% positive this was the problem. Thanks for the instructions. I’ve been pulling my hair out trying to figure this thing out. I had the same issue as well. Evidently, Roxio does the same thing and moves stuff (or whatever it does… it’s the RoxioWatch##.exe file that does it). My solution was to enter processes and end the process (don’t do this unless you know what you’re doing). I don’t have Google Desktop nor do I have Roxio and I keep getting these errors on a download I’ve started the last few days. I can’t figure out what the process might be that is conflicting with Vuze. I uninstalled itunes, which I never really used much anyway. It wasn’t that. It’s annoying, I wish I knew what avenues I could try in order to figure it out. HempHeads….this is what I found on another website…..like you, I didn’t have the programs listed on this page but was still getting these flush errors.